In this video we take you step-by-step through the process of building your first WordPress website. We’ve covered everything you need to know and do in order to launch your new site. Don’t worry. Our guide is suitable for complete beginners. WordPress is free to use and for the purposes of the video, we have chosen a free WordPress theme. Your only costs will come from buying your domain name and from buying hosting services. Depending on the domain name you and hosting package you choose, you should be able to build your own website for around £65 (or $85). You have to register a domain name for your website. If you’ve already got one, great. We’re sure you know what a domain name is but if you’re not sure what we mean, it’s the .com or .co.uk or .net name that you type in when you want to see a website.We recommend GoDaddy (affiliate link). It’s one of the longest standing domain name registrars and they still offer some of the best rates and customer service around. We don’t recommend GoDaddy for website hosting. It’s so easy to buy a domain name. Set up an account, find your perfect domain name, pay your fee and there you, your shiny new domain will be sat in your GoDaddy account. Leave it for now, we’ll come back to it. I use HostGator for almost all my hosting. They offer good customer service and good technical support. They are also really affordable, essential when you’re setting up on a budget. The dashboard is simple to use so it’s easy to set up your WordPress site. When setting up your account, go for the standard Web hosting. They do offer WordPress hosting, but standard web is the best. All of the HostGator plans come with a free SSL certificate, so take advantage of that. Plans are available for single websites or multiple websites. It’s a step-by-step sign up process, very simple to complete. I have a coupon for you to use. It is EAGLE30. It is an affiliate coupon, so I will earn a small commission if you use it. Thank you if you do. HostGator will send an email to you to confirm your new hosting account. Keep it safe – you will need that information in the next step. Go back to your domain name registrar and login to your control panel. Here we are looking to update your DNS (Domain Name Servers). There will be a section in your domain name account where you can manage your name server settings. To install WordPress, you need to go back to your HostGator account. You need your username and password, which you can find on the email from HostGator. Once you’re in to your HostGator dashboard, find the ‘Build a New WordPress Website’ link. Click the link, select your domain name and follow the steps. You will be asked to give your blog (website) a name, for a username (Admin user) and the email that will be used for admin purposes on the site. Click ‘install’ and wait a few moments. You will then get your installation details, including a password to login to your WordPress dashboard. Make a note of your password. To login to your WordPress dashboard, go to yourdomain.com/wp-admin and use the username and password from your installation details. You’re in! If you want to change your password to something more memorable, go to the top-right of your WordPress dashboard, click Howdy, [username] > Edit My Profile. Scroll down to Account Management and change your password there. It will generate a new one for you or you can type in your own. Click Save and you’re done. Once you’re logged in, there will be some plugins that come pre-installed. Go through them and get rid of the ones you don’t want. To do that go to the menu on the left-hand side, go to Plugins > Installed Plugins. I always delete Hello Dolly. It’s just a bit of fun and surplus to requirements. I always keep Akismet. Apart from that, it’s up to you. I n the video my WordPress install comes with a Google Analytics plugin, which I keep, plus a couple of other plugins, including a contact form plugin, that I deactivate and delete. I have my preferred plugins that I will install later. The WordPress theme is what gives our website its look and feel. It’s all the design features and elements and it’s where we add the content (the enhanced functionality comes from the plugins). Find the files you just downloaded and then click install files to upload them. Once the theme has been installed successfully, you need to activate it. You can then check your site again to see the new theme. It doesn’t look like much right now, but you can see the change. At this stage I’m adding a new plugin called Elementor. It allows us to build web pages using a drag and drop method. Go to Plugins > Add New and then search for Elementor Page Builder. Click the ‘Install Now’ button and the plugin will be added to your site (don’t forget to activate it!). This is the point where you should install your SSL certificate. SSL stands for Secure Sockets Layer. It is standard security technology for establishing an encrypted link between your website and the user. This link ensures that all data passed between your website and the users’ browser remains private. SSL certificates help establish trust and that’s crucial – if your customers and users feel safe on your website, they are more likely to spend their money or part with their personal information. Plus, Google will favour sites running on a secure connection over those that are not. HostGator will have installed an SSL certificate for you when you first set up your account. To check that it is there, go to your dashboard and in the URL box and type in https:// before your domain name and hit enter. It might ask you to login again but that’s OK. Login again and make sure that you can now see the green padlock and Secure message. If you can see that, it means you’ve got the SSL certificate installed. Now all you need to do is go to Settings > General and change the WordPress Address (URL) and the Website Address (URL) to https:// and save your changes. Now when you visit your site, you should see that it is secure. If you add the SSL at this stage, everything you add to the site (content, images etc) will be secure and will not affect your secure connection. Sometimes if you install the SSL certificate in hindsight, you will still get elements loading over an unsecure connection and that will affect the site security. At this stage I am going to change the structure of the URLs for the website. To do this, go to Settings > Permalinks. Now you’re ready to start adding some pages. Let’s start with a homepage. Go to Pages > Add Page. Give your page a name, Home in this case, and then choose your page layout. To do that go to the right-hand panel and choose the template dropdown menu. I’m using a full width page because I don’t want my homepage to have a sidebar. Publish the page (blue button in the right-hand panel). Now using Elementor we’re ready to start building the page. Elementor has built in templates that you can use to create pages in super quick time. Have. Scroll through and see if there’s anything you can use for your website. Some of the features are only available if you use the premium version of Elementor and/or your theme. If you find something you want to use, it’s one click to insert it into your page. 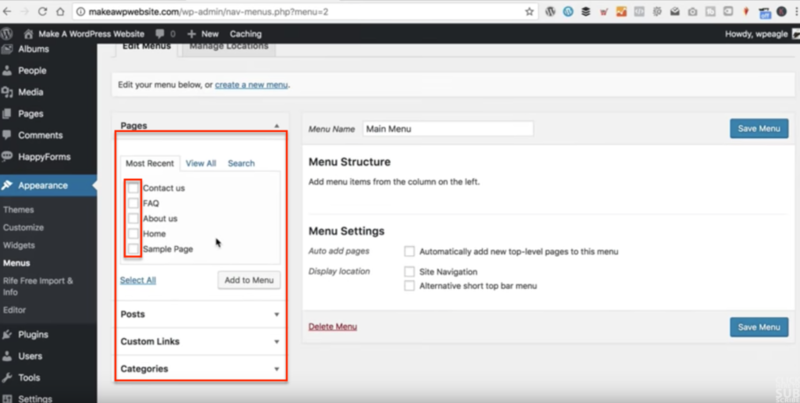 If you are logged into your WordPress dashboard and are viewing a page, you can edit that page by clicking the Edit with Elementor button in the bar at the top of the screen. To edit a section or an element on the page, click on the element and the options appear in the left-hand panel on your screen. It’s very intuitive. Just remember to click update [to save your changes. You can really change pretty much anything you want. It’s a bit like using a programme like Word. You can also change CSS elements without learning CSS. Play around with it to get the look you want. What is really unusual and absolutely brilliant about Elementor is that you can right-click on a section to make changes. If, for example, you have a background image you want to change, right-click and select Edit Section. All the settings to do with that section will appear in the left-hand panel and you can make your changes. To add an element, you go to the left-hand panel and select the grid icon. You’ll then see the drag and drop elements. Select your element and drag it to your page and drop it in the section you want it in. In this part of the video we add an About Us page, a FAQs page and a contact page with a contact form. If you are a complete beginner, Elementor comes with some great ready-to-go page templates, so to start with, you might find it easier to use one of those to build up your pages. It also comes with some ready-made blocks. Things like accordions, expanding text boxes and two column set ups. For a bespoke contact page, create your page like before. This time we’re going to add a contact form plugin so that we can add a form to the page. Navigate back to you WordPress dashboard and go to Plugins > Add New Plugin. In the search box search for Happy Forms, my current, preferred contact form plugin, and install and activate it. This form plugin is very easy to use. Once you’ve installed the plugin you will see that there is a sample form already there. The easiest thing to do is to edit that form and add or delete the fields you want/don’t want. 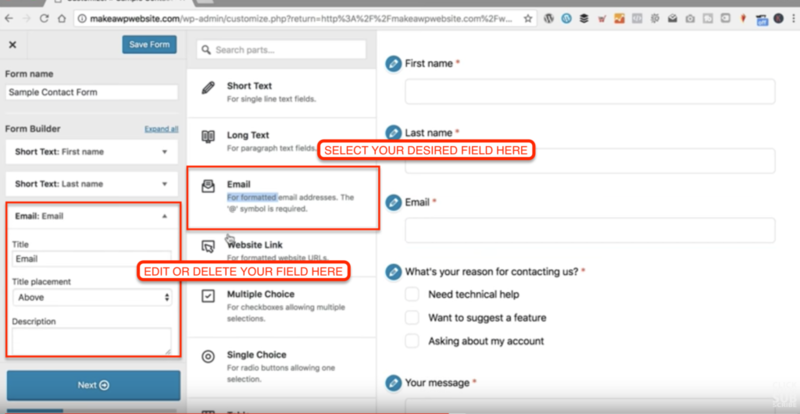 Once you have configured and saved your form, head back to your contact page and use Elementor to add the form, just like you would with any other element. Click the grid icon in the Elementor header. This will bring up the admin panel on the left. Scroll to the bottom of the panel until you get to the section labelled WORDPRESS. There you’ll find your Happy Forms element, amongst others. From your dashboard, go to Appearance > Menus and create your main menu. You will notice that the pages and posts you have created are listed on the left of the menu screen. Here you can select the items you want to appear in your menu. Tick the box and add them to your menu. You can then drag and drop the menu items into the order you want them to appear in your navigation. First things first, you need to a blog page that will show your latest blog posts. It’s the same process as before but this time, when you are choosing your page template, use the default template. To make sure that this is the page your users see when they visit your blog, go to Settings > Reading > Your homepage displays and Posts page. From the dropdown menu select the page. You created for your blog. And don’t forget to add your new blog page to your main menu so that your blog appears in the site navigation. To add a blog post in WordPress, you go to Posts > Add New, just like you do with the pages. Five your post a good title and then add your content in the main window. You should add a featured image for your blog post. This is what will appear on your blog page with an excerpt of your post. To add your featured image, scroll down and keep an eye on the right side of your screen. You will see a section that says Featured Image. Click ‘set featured image’ and you will be prompted to add your image. You will also see in the right-hand panel, a section for Categories. This is how you organise your blog posts. To check your blog settings within your theme, go to Appearance > Customise and you’ll find a whole menu of settings and customisations for your theme. Go to the blog settings (make sure the blog page is on the main screen). You can play around with all sorts of things in the blog settings. You can add a sidebar, decide whether you want to display the post media, decide whether you want author displayed, show comments, add a background image to the title… the options are many so have a play around with them all. As you’ve seen in the previous step, there are lots of theme options to play around with, to customise your website. These options include things like adding your logo to the site, changing colours and fonts, adding your social media icons and adding a favicon. Take some time to browse all the options and try turning things on and off, play with the colours and fonts and really get to know your theme. To upload your logo, you need to go to the General Settings and upload your logo image. Use an image around 400 pixels wide. To add your favicon, go to Site Identity and add your logo or a special favicon image there. When you have finished making changes to the site customisation, don’t forget to click the Publish button to save all your changes. If you haven’t already, set up a Google Analytics account for your new site. Go to google.analytics.com and sign up (or in). It’s a completely free tool and will help you understand how people use your website. You need to add your website as a new account in order to get your tracking ID. In this case, I left the Google Analytics plugin that came with the theme installed. So, once the Goole Analytics account is set up I simply go to the Insights plugin and follow the steps to authenticate my Google Analytics account. You can check if it’s working by logging out of your WordPress dashboard and visiting your actual site. Click around a little bit and then head over to Google Analytics and see if it is tracking your visit. I have loads of great videos on all things WordPress and about making money online. Subscribe to the WP Eagle YouTube channel here. I have been following your tutorial step by step but have hit a snag. We can’t display your DNS information because your nameservers aren’t managed by us. HELP!!! What do I do next. Hey – login to your domain registration company and check what servers you have entered in the DNS (Nameservers) settings. Should give you a clue on who is doing your DNS.